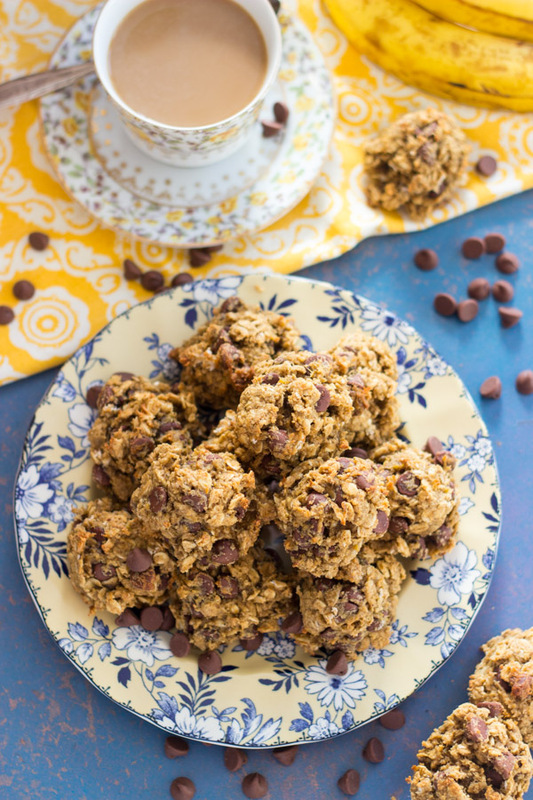 These Chocolate Peanut Butter Banana Breakfast Cookies are a cinch to whip up, and they’re so hearty and filling! 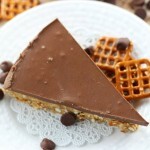 A little decadent too, but a mostly healthy breakfast, and one that you can easily take on-the-go! Good morning!! And what a good morning it is when you get to eat cookies for breakfast! 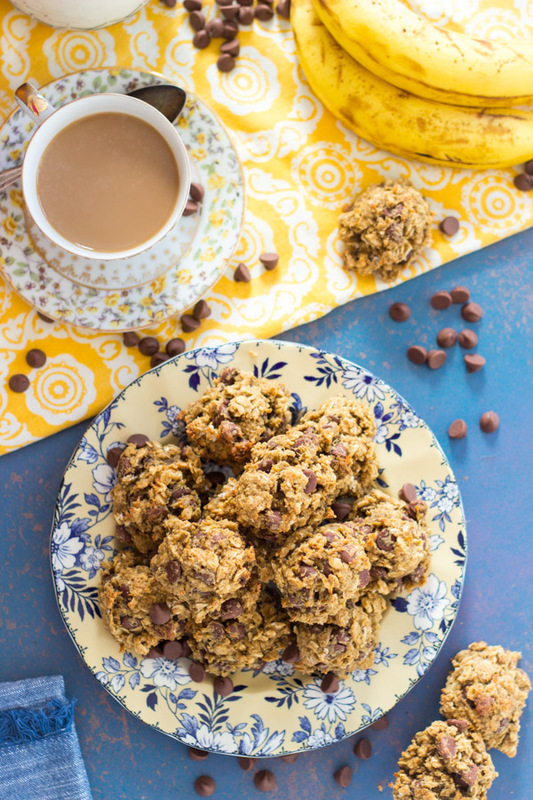 These Chocolate Peanut Butter Banana Breakfast Cookies are cookies that you can feel pretty good about too. It’d be a lie if I flat-out called these healthy. They are not perfectly nutritious, but they are pretty damn close. It’s primarily just the chocolate holding these back from the title of ‘healthy’, but it’s not even much, and you have to live a little. They’re still totally breakfast-appropriate, and very nutritious overall. 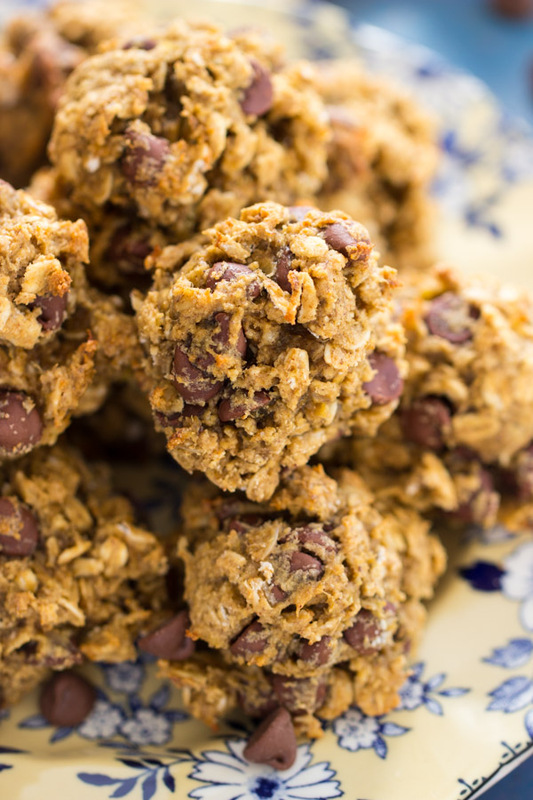 We love these Chocolate Peanut Butter Banana Breakfast Cookies. You cannot go wrong with the combo of chocolate, peanut butter, and banana. Such a favorite. 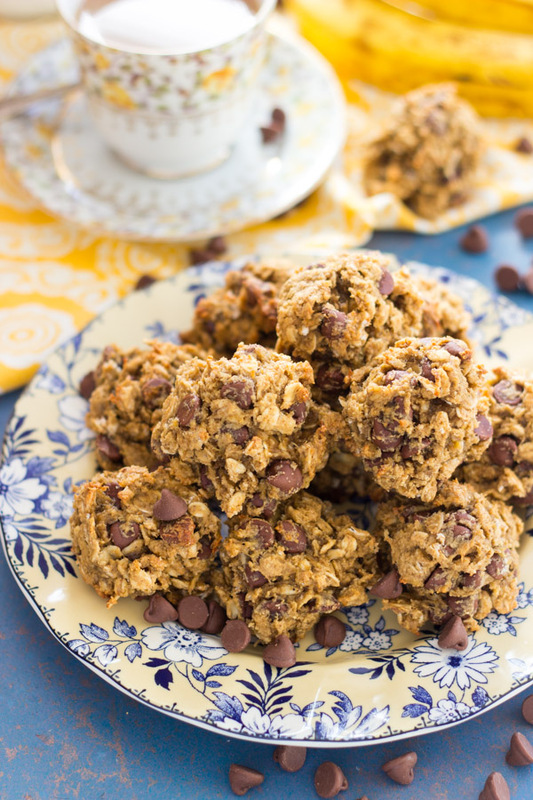 These Chocolate Peanut Butter Banana Breakfast Cookies are really hearty and filling, so 1 or 2 is very satiating and satisfying, and will stick to your bones for a hectic morning. Oats and bananas for healthy carbs, peanut butter for healthy fats, and chocolate to make it worth getting up in the morning! 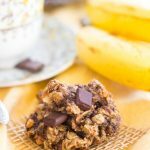 I did share another breakfast cookies recipe a few weeks ago, these Chunky Monkey Cookies (chocolate, banana, walnut, plus peanut butter too! ), and to be completely forthright, I have another one coming. 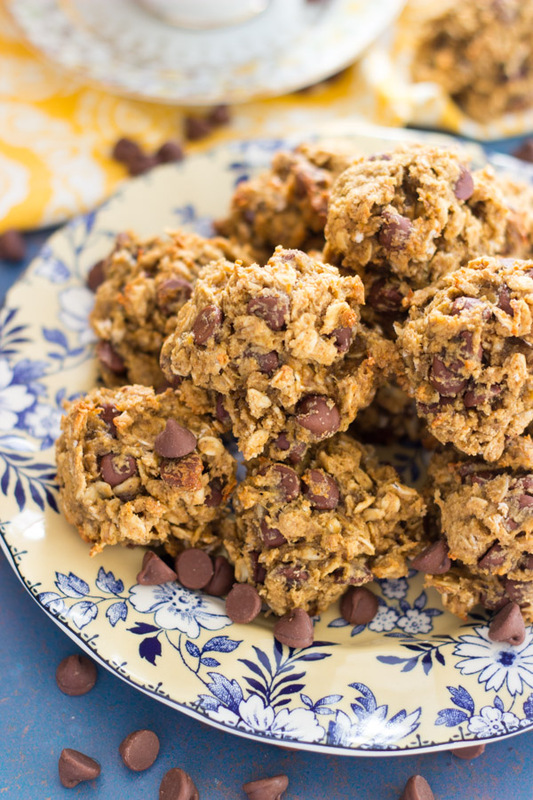 I hope you’re not burned out on breakfast cookies, but the next one is substantially different than either the Chunky Monkey Cookies or these Chocolate Peanut Butter Banana Breakfast Cookies. 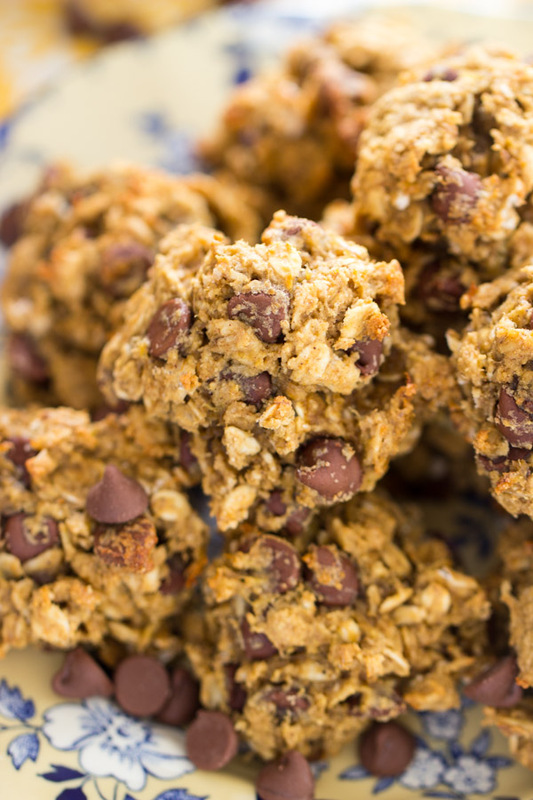 Variety is the spice of life, and a staple like breakfast cookies is something that you can stand to have a few options. We make big batches for snacks and breakfast on-the-go, and it’s nice to mix it up frequently. Incidentally, I’m sorry for when I use bold font and I repeat phrases or certain wording. I’m sure it gets annoying to see that scattered throughout my posts, and repetition of phrases over and over, but what’s really annoying is that Google doesn’t show my stuff to the internet world, and I’m working on ways to get Google on my side. Blogging is a funny thing. I spend hours and hours working on my blog – more than you would probably believe, even if I gave you a complete rundown – but blogging is funny because you can spend hours on one single post, and then it can end up only be viewed a few times. 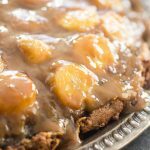 I have thousands of readers daily, but I’ve got recipe posts that have only seen like 200 sets of eyes total. All that work, and it doesn’t get visibility if it doesn’t please the search engine gods. I apologize for the bold font and repetition of phrases at times, but I’m trying to get better about optimizing my posts for Google to know what they’re about, and actually show them to people. I hope it’s not a major nuisance. I don’t want to have to do it, but I also can’t keep pouring my time, energy, heart, and soul into creating posts, and then they’re not seen, ya know? What would be the point? Okay, with that sidebar out of the way, back to this Chocolate Peanut Butter Banana Breakfast Cookies recipe (bold for Google!). I packed a bunch of these for S.O. to take to work, and he told me that he found several in a bag in his trunk after a few days, and was so hungry that he ATE THEM! He was asking about their perishability. Three days spent in the trunk of his car in the summer heat in Florida?? Yikes. But he lived to tell about it, so I guess they were fine! Gross. If you love chocolate + peanut butter + banana together, check out these Elvis Brownies (with bacon!!). They are bomb. 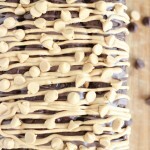 These Peanut Butter Banana Brownies are so thick and tall, and that peanut butter frosting is killer. This Chocolate Peanut Butter Cup Banana Bread also makes for a great snack or breakfast! 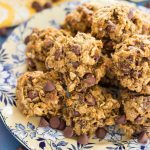 These Chocolate Peanut Butter Banana Breakfast Cookies are a cinch to whip up, and they're so hearty and filling! 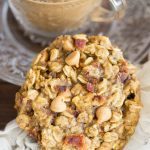 A little decadent too, but a mostly healthy breakfast, and one that you can easily take on-the-go! Drop by golf ball-sized scoops onto parchment paper-lined baking sheets. Can all purpose flour be substituted if I don’t have oat flour?